Update: Republished at the Australian Football website. With thanks to demonwiki.org and the 'AFL Tables' reference site, we could trace the footballing arc of the 'man of the moment', Cameron Schwab. In preparing this post, we tweeted the two below snippets... teasers if you will. [2/2] Not having a go at #CameronSchwab, just presenting some facts. And of course, the first got multiple retweets and replies, while the caveat follow up was largely ignored. 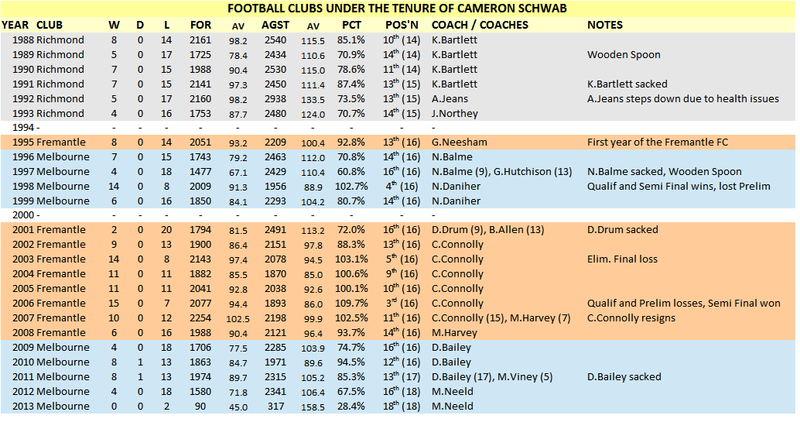 The majority of tweet replies were non-complimentary about Cameron Schwab, so it may be of interest to the naysayers that Schwab has himself contributed quite substantially to the AFL landscape. The below table is a list of clubs that Cameron Schwab has held senior positions at, along with the teams performances over those seasons. There is no doubt that Schwab had no direct impact on the game day performances of the clubs below, and we make no inference on any cause and effect. The data is just presented here as a statement of fact. We also note that Cameron Schwab has held positions of influence in clubs that have gone through difficult circumstances, and under these conditions, the clubs have performed to a suitable level, and sometimes even admirably. - He became General Manager of Richmond in 1988, just 1 year after the Tigers 'Save Our Skins' campaign that almost bankrupted the club. Was at the helm for 6 years, helping steer the Tigers back to solvency and good governance. Was also the youngest club GM in VFL/AFL history. - Was a "full time consultant" during the foundation of the Fremantle Football Club as it established its club, playing list and operations in 1994 to be ready for its 1995 on field debut. - Returned to the Demons (after initially working for them as a junior admin staffer) to be Football Manager, and later CEO. He was part of the foundation of the Neale Daniher era at Melbourne, that saw the Demons play 4 finals series in 10 years, including the 'Millennium Grand Final' of 2000. - Returned to Fremantle in a period of club malaise to be CEO, and oversaw the era that had Fremantle play finals for the first time (2003), and run on into its most successful era (until the arrival of Ross Lyon). - Returned again to Melbourne, as the club made progress toward securing their administration and training facilities. The club also commenced and succeeded in its 'Debt Demolition' program in this time. - During 2000 he was also CEO of afl.com.au. Data is just data. Without context it can be mis-interpreted and mis-read. The less numerical, more intangible, even nebulous effects that any person can have in public and private life needs to be understood as a whole. Cameron Schwab took on hard tasks, clubs in difficult times, and even developed businesses from scratch or for the better. We wouldn't consider him "the Dees unsung hero", but we ask you to consider the bigger picture. NEW INTERVIEW: Neil Whyte (EFFC / Applecross) talks about East Fremantle FC's modern-day problems. You can contact The FMI via twitter at @The_FMI, or email via tkyc.mail(at)gmail.com.